The Young Scientists Club was founded in 1999 by Esther Novis, a Harvard-trained biologist and mother of five, as a fun and educational way to keep her kids entertained and engaged over summer break. She created activity kits with one specific goal: to spark kids' interest in science by offering An Educational Science Adventure That Lasts A Lifetime. Kits from The Young Scientists Club can be used individually or as components of a sequential curriculum, making them great for both the casual science lover at play after school or for a whole class, when bought in a School Pack that includes teacher instructions and enough supplies for 30 students to participate. The Young Scientists Club kits are offered in four categories: The Young Scientist (each set contains three complete kits and can be completed sequentially to expound on the knowledge learned from each one), Magic School Bus (Mrs. Frizzle and her students from the popular book/TV series help introduce scientific concepts), Nature (plenty of hands-on experiments for kids to get their hands dirty with!) and Adventure Science (experiments for young scientists who like to live on the edge!). There are also some games and mini-kits that defy categorization, like the Go Green - Save the Earth kit that teaches kids about acids and bases and the three Rs of recycling. We received the Science on a Tracking Expedition, which teaches kids to identify animal tracks, learn about the animals that make the tracks, cast animal tracks, play a tracking game, create animal track prints, design an animal track poster, and explore real animal tracks in nature. 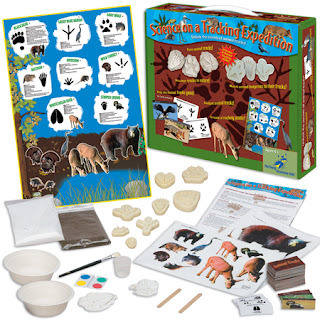 It comes with eight animal track molds that you use with sand and plaster to create realistic casts, just like real scientists do in nature. Roo and Jasper are all about spotting tracks in our yard and on walks, so I knew Science on a Tracking Expedition would be a fun project for them. The Animal Tracking game and full-color sticker poster were great but the plaster casting was perhaps a bit advanced and messy for Jasper! I appreciated how the instruction booklet is written for parents or teachers to be able to facilitate the experiments without doing them for the kids. I also think it would be fun to use the track molds to press into cookie dough, maybe for a safari-themed party in the future. I can definitely see how The Young Scientists Club kits would be great for keeping kids busy over school breaks. I especially like how they introduce concepts that parents can embellish with peripheral materials and trips to the library, so if kids gravitate to a specific topic you can continue the conversation. The Young Scientists Club kits are sold at independent toy stores nationwide. Check their website to see where to find The Young Scientists Club is available near you. Disclosure: In accordance to the FTC Guidelines and WOMMA Code of Ethics, I am disclosing that I received the Science on a Tracking Expedition kit in order to write a balanced review. Thsi toy is officially awesome!